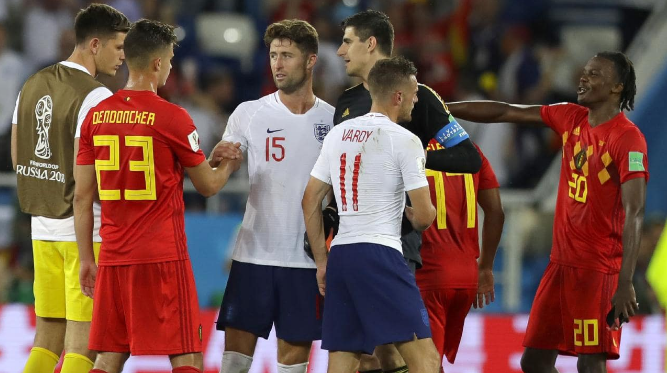 Belgium beat England 2-0 to finish third in the FIFA World Cup 2018 on Saturday. Thomas Neunier goal gave Belgium the lead in the first half and Eden Hazard scored the second goal in 82 minute. England crawled back into the game but there were not any clear cut chances for the three Lions. The second last match of the World Cup 2018 is over and Belgium’s Thomas Neunier goal in the fourth minute hands Belgium third place at the 2018 World Cup. The closet England came to scoring was in the second half when Marcus Rashford slipped a beautiful pass to Eric Dier who calmy chipped it over Courtos but only to be cleared from the goal line by Toby Alderweireld. In the last Hazard finished with strike a goal in the 82 minute, with a brilliant through ball played by Kevin De Bryune to erase any England’s chance for the third position. Eric Dier and harry Kane came closet to the scoring but was denied a consolation goal from the Belgium defenders. They were better since started in the second half , Belgium took Bronze and looking at their performance they deserved more. England Manager Gereth Southagate made five changes to this team for World Cup Third Place Play off against Belgium but the tournament’s top scorer Harry Kane starts. Ruben Loftus-Cheek, Eric Dier, Phil Jones, Danny Rose and Delph al come into the starting line up after beginning on the bench in the semi final defeat to Croatia. Kane, Who with six goals in favorite for th Golden Boot , will start alongside Raheem Sterling. Both the team Belgium and England will return Home from the Russia, after some memorable performances. But both the team have a great opportunity to build ahead of the next World Cup in Qatar.